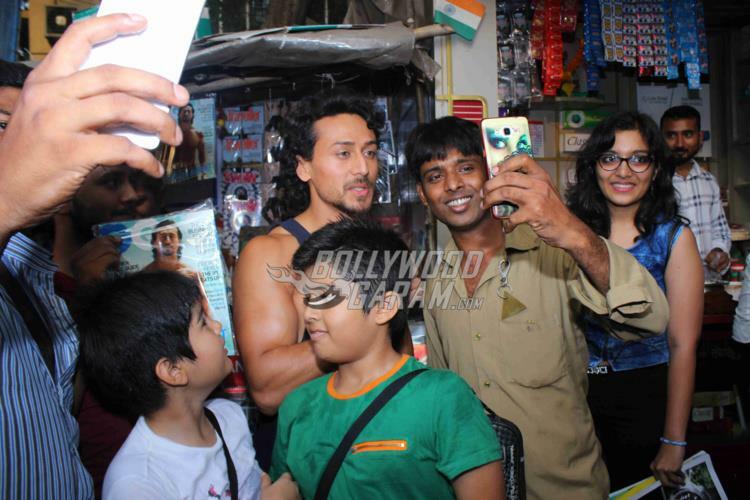 Photos - Tiger Shroff stops to buy GQ magazine featuring him as cover boy! Photos – Tiger Shroff stops to buy GQ magazine featuring him as cover boy! Jackie Shroff’s son Tiger Shroff has become a popular name among the youngsters. The Heropanti actor was snapped at a magazine stall in Mumbai on May 5, 2017. Tiger was seen buying the GQ magazine which features him on the cover. The actor was seen in a blue vest and a pair of denims. Within minutes of his stoppage at the magazine stall, the actor was mobbed by fans. Tiger obliged with selfies, autographs and photographs with his fans. Tiger was last seen in the movie A Flying Jatt and is currently filming for a number of projects including Munna Micheal, Adhoora and Baaghi 2. His latest upcoming film, Munna Michael also stars Nawazuddin Siddiqui and Nidhhi Agerwal and is directed by Sabbir Khan. The story of the film is about a young man who is a huge fan of the singing sensation Michael Jackson. In case it slipped your memory, this the same magazine cover for which director Ram Gopal Verma called Tiger a bikini babe. You can read all about the controversy right here.